Since cutting out some obligations and projects, I've had more free time and I'm loving it. As an introvert, I love spending my free time wrapped up in a blanket on the sofa reading a great book or watching an entire TV series :) I especially love these activities on weekends or gloomy looking days. I'm looking for book & TV show recommendations. The only TV show I'm currently committed to is Scandal, but I know there are other great shows out there. 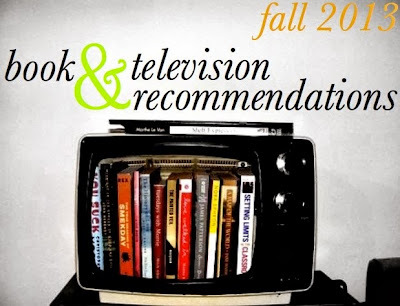 Leave a comment with your TV addition and/or a great book you've read recently! When others are searching for recommendations, they'll appreciate your ideas too! NYPD Blue was a groundbreaking show. Seeing Woody Allen's Annie Hall? Classic movies! Cagney, Old movie sirens: Lena Horne! The Mindy show is pretty funny, I always watch that. Everyone I know is addicted to Homeland too. As for reads, try Reconstructing Amelia-I'm not too far into it yet (need more free time! ), but so far I'm loving it. If you haven't read the Glass Castle, it's a must read! Also - Rules of Civility or the Paris Wife. I love watching on Sunday night Revenge and Betrayal its intense. Ugh I love Scandal. If you're into scary stuff I recommend American Horror Story because it has some amazing oscar winning actresses in the staring roles. haha ya winter and fall is when I catch up on shows too. I love HBO's Girls, it's hilarious. and Orange is the new Black if you have netflix! Oh I got you on the TV front - Orange is the New Black is SO GOOD. New Girl and Modern Family for laughs, of course. And I really like Hart of Dixie and Once Upon A Time, not really for quality of content - but more for a brain break! Also, Castle's a pretty great crime show if you're into that! i've been watching the blacklist and sleepy hollow. can't wait for dracula. I am a huge fan of Suits. I still have to watch it as I recorded all of this Season's, but it is awesome! My TV addiction lately is Walking Dead and Game of Thrones!! Downton Abbey - surprisingly good! Reign - it just started on the CW & we're hooked! American Horror Story - season 1 was great, we recommend skipping season 2, & season 3 is good so far! We need to take your advice & start watching Scandal! That & Orange is the New Black. I love grey's anatomy and modern family! If you can stand gore I would recommend Dexter. It's really interesting because it explores what it is to have feelings and fit in society from the perspective of a sociopath and serial killer. If you like action movies or superhero comics, I would recommend Agents of Shield! I've been watching it and it's been exciting. If you haven't read the Hunger Games or Divergent I would suggest those. I read a really wonderful, but depressing, fantasy book called Who Fears Death? by a Nigerian-American author. The protagonist had a lot bad things happen to her. But it was nice to read something different from usual fantasy novels that seem to be set in Medieval Europe. I have been loving fall TV lately! I'm obsessed with American Horror Story Coven, Project Runway (All-Stars is coming up), Parenthood, Elementary, The Blacklist (just got into this, the show is soo addictive), etc. In terms of books, you can refer to my post again lol. But I'd also recommend this book that I'm letting my father read, called Things Fall Apart. I forgot how much I loved it until I had to reread it for my history class this semester. I love Scandal so much; you should try watching Revenge and Person of Interest. Thanks for the lovely comment on my blog.